"A group of individuals, paddling clubs and businesses dedicated to helping Green Grand Rapids achieve the dream of putting Rapids back in the Grand for everyone's enjoyment - especially the thousands of kids in our area." UPDATE: Visit the GRWW Website. Visit the GRWW Group Page on Facebook. The following links will lead to videos from advocates of bringing whitewater features back to the Grand River in Grand Rapids, Michigan. Similar projects are being considered for the Bear River in Petoskey, the Flint River in Flint, and the Huron River in Ann Arbor. The following link leads to a short press release from American Whitewater. The information pertains to a proposal for new whitewater in the town of Oroville, California. Similar to proposals for whitewater projects across the United States, planners are faced with balancing the costs and needs of various user groups. Similar to Argo Dam, the installation of a whitewater park could represent a significant up-front investment followed by long-term, sustaining income and low annual maintenance costs. For the life of the Argo Impoundment, the City of Ann Arbor will be responsible for managing invasive aquatic plant species, dealing with the on-going build-up of sediment behind Argo Dam, and servicing the decades-old dam itself. Removing the dam will have high expenses associated with the physical removal, planning and removal of sediment, and restoration in the 27-acres of public land that will be de-watered. But a free-flowing river of improved water quality between Barton and Geddes will require minimal maintenance costs in the long run. Revenue associated with facility and equipment rentals could increase. User fees charged to whitewater boaters would be an added bonus (I would gladly pay 5 bucks to paddle clean, retentive features for a day). Commercial development, likewise, could benefit the Ann Arbor community. If you feel strongly that the Huron should flow freely from Barton Dam, along North Main Street, past the North Side Grill and the U of M hospital complex, to join the already beautiful section of river winding through Nichols Arboretum, then it's not too late to make your voice heard. Likewise, if you are a paddler, fisherman, someone who enjoys parks or appreciates restoring nature, you still have opportunities to advocate on behalf the Huron River. The presentation was given during the first hour of three public meetings, which were held to receive public input on the future management of Ann Arbors four impoundments. Paddlers interested in learning more about the history and potential future of Argo Dam will benefit from this program. "To dam or not. That is the question the City of Ann Arbor, environmentalists, and community recreation groups are considering for the Argo Dam. Matt Naud, City of Ann Arbor Environmental Coordinator; Laura Rubin, Executive Director of the Huron River Watershed Council; and Coach Rich Griffiths of the Pioneer High School Crew Team each weigh in on this controversial issue affecting our Huron River." "One point that continues to get lost in the discussions about Argo Dam is that a whitewater paddling community has existed in Ann Arbor for over 40 years. 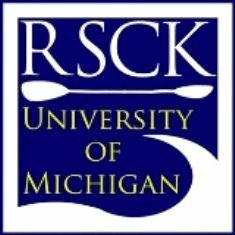 The University of Michigan’s Recreation Sports Program has been the home of the Raw Strength & Courage Kayakers (RSCK) since 1967. RSCK introduces 200 new students and community members to the sport of kayaking each year. Winter months are spent training in the pool at the U of M’s North Campus Recreation Building. In the Spring, new paddlers get checked out on the Huron River. A few locations upstream of Barton Dam allow for the most basic practice of whitewater maneuvers, but these sites are not maintained and are steadily losing their value (after all, they were mill sites over 100 years ago). Whitewater kayaking is far from a “new group of paddlers,” as some have suggested. Businesses, such as the Kayak Corral in Saline, the Bivouac, and Sun and Snow Sports have catered to Huron River paddlers for decades. New businesses such as REI and Moosejaw do the same. Paddlers from as far as Windsor, Toledo, and Lansing drive to the Huron each Spring and Fall to take advantage of favorable water flows. We support local businesses and feed Ann Arbor’s famous parking meters. 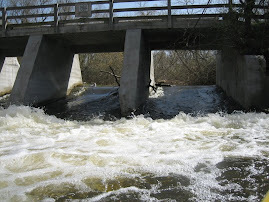 It’s time that whitewater kayakers are recognized as a real, sustaining, and growing user group of the Huron. My name is Cameron Savage and I grew up in East Lansing, Michigan. I'm turning 19 this spring and I have been whitewater kayaking for over 10 years now. Kayaking has taken me all over the world. From paddling the warm rivers of Costa Rica, to the mountain streams of the southern US, to my summers working on the Ottawa River in Ontario, Canada, kayaking has always been a part of my life. I've competed in freestyle kayaking for 4 years, with notable top finishes as a junior in the 2006 World Cup, 2006 US Team Trials and a 2nd place finish in the 2007 North American Championships. This spring I hope to do well in the 2009 US Team Trials, hosted in Glenwood Springs, Colorado. The competition site is a very successful man-made whitewater park completed in 2008. I hope to place high enough to compete in the World Championships this fall. Whitewater kayaking is an amazing sport. Many people from all over the world participate in the sport, which is eco-friendly and constantly growing. Festivals and Competitions all over the country have attracted international media attention, and there is a large push for the sport to be featured in the X-Games and more prominently in the Olympics. 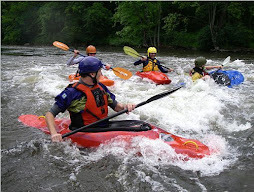 Whitewater kayaking is an extremely safe activity and has many prominent and well-funded bodies ensuring the continuation of this. And although someone who doesn't paddle might not know this, there are hundreds to thousands of people in each state who paddle whitewater every year. That number will grow with the continued granting of access to rivers. When I started boating at age 8, one of the few beginner whitewater rivers anywhere close to mid-Michigan was the Huron. Through my parents' formed kayaking club, the Lansing Area Whitewater Paddlers (LAWWP), we would take trips down to Ann Arbor to do easy runs for the day. They were very fun and I have a lot of great memories of learning on the Huron. The problem is that once you are able to paddle rivers above the difficulty of the tame section of the Huron that has some whitewater on it, there isn't much else anywhere close to mid-Michigan. The closest mid-level whitewater to here is in Pennsylvania. This leads to difficult issue of being a whitewater boater in Michigan –your choices are very limited. I've always discussed with my fellow Michigan kayakers the prospect of having a decent whitewater park in the area. They have been popping up all over the country and have become quite popular! Some notable parks that I have been to, and enjoyed, are Watertown NY's Route 3 Wave and Hole Brothers (which have held numerous national and international competitions), Minden Ontario's Wild Water Preserve (which is a beautiful, 7km long man-made whitewater section that has been able to keep an amazingly natural look), South Bend IN's East Race (an epicenter of whitewater sport in the mid-west) and many more. East Lansing even unknowingly hosts an awesome river feature on the Red Cedar (behind the Library building at MSU), which when the river level is right, attracts paddlers from all over Michigan (I have even been in the local papers twice for surfing the wave there). Whitewater features are very easy to construct, and man-made features are often constructed as alternatives to dangerous and unnatural dams. Another considerable bonus of whitewater parks is the obvious fact that they bring people to the area. This is great economically and has been proven so by a number of parks in the past few years (i.e. Reno NV, Salida and Pueblo CO, not to mention the US National Whitewater Center in Charlotte, NC). They are also 'cool' and provide a fun way to get people outside and enjoying nature. When I heard of the possibility of a park in Ann Arbor, all I could think was "brilliant". Ann Arbor is the perfect town for a project like this. It has a large enough community to appreciate it and it's cool and edgy enough to attract boaters from all over. I currently go to school at Champlain College in Burlington, VT. One of the main reasons for coming out here was to be able to kayak more while in school. I found out this year, though, that it is not the right school for me and I am currently in the process of applying to schools. One of my top choices is U of M and the prospect of having accessible whitewater in the area would be a very persuading argument to choose it. The University of Vermont Paddling Club, which I am a part of, has grown so much in the past year, that we can't even accommodate the numbers that flock to our weekly pool sessions. Freestyle kayaking or 'playboating' is becoming increasingly popular with people my age and it is a very cool and easy sport to get into. All we need is one, natural looking, retentive feature, that is easy to access and maintain at many water levels. This appeals to boaters of every skill levels, from first-time beginners to full on professionals. I am very excited for future of this project in Ann Arbor. As the word gets out, you will notice that many whitewater boaters also feel the same way. Michigan could become a state that is desirable for whitewater, and this is the first step. If you need any more information or help in regards to the project, contact me. 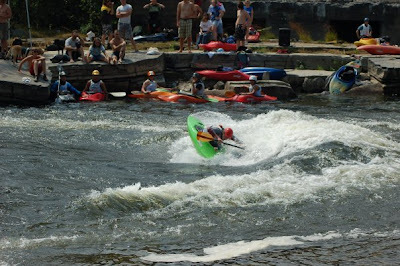 Please seriously consider the possibility of a whitewater park. It will make more of an impact that you can imagine. YPSILANTI, MI 2009-02-04 Listen to this week's Issues of the Environment from WEMU, featuring Ann Arbor's Environmental Coordinator Matt Naud, who discusses what's involved in balancing recreation with environmental issues on the Huron River.